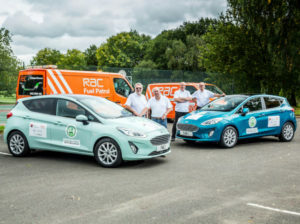 The most remarkable results in the history of the Fleet World/ALD Automotive MPG Marathon were recorded at this year’s event, including the highest ever figure for a diesel car and a petrol-engined competitor nearly topping 100mpg, proving that green engine technology in all its forms is moving on in huge strides. The overall winner, with a record-breaking fuel economy figure of 122.0mpg after more than 350 miles of mixed route driving, was a Ford Fiesta 1.5TDCi (120PS) Titanium driven by Paul Clifton and Ian McKean. Winner of the petrol category was its sister car, a Ford Fiesta 1.0 (125PS) EcoBoost Titanium driven by Andy Dawson and Andrew Marriott which achieved 97.1mpg – outstripping the previous highest petrol figure by some margin. The Most Improved category, usually dominated by larger-engine cars, saw a Honda Jazz 1.3 i-VTEC EX Navi Manual driven by Fergal McGrath and Doug Clifton improve over its official combined figure of 55.4mpg by a massive 60%, reaching an impressive 88.7mpg. But it wasn’t just the petrol and diesel cars which garnered praise. This year’s event included two electric vehicles which both exceeded not only the manufacturers’ estimated ranges, but also their NEDC energy economy figures – a feat which most experts would claim to be nearly impossible. The Hyundai Ioniq Electric of leasing company ALD Automotive pairing Chris Britten and Hannah Dunsdon averaged 6.2 miles per kilowatt-hour over the two-day event; a 15% increase, equating to a potential range of almost 200 miles to a full charge. Van Fleet World editor Dan Gilkes and co-driver Ray Penford, meanwhile, achieved a 10% uplift on the brochure figures in the Renault Kangoo Z.E. with its new longer-range battery. The team averaged 4.5 miles per kilowatt-hour of electricity, again offering a range of close to 200 miles between recharging stops. Commenting on the results, Alex Grant, editor of Fleet World, which organises the event said: “For the first time ever, every single vehicle in the MPG Marathon beat its official figure, which suggests that manufacturers have really got their house in order over fuel economy claims. “That the winners achieved record-breaking figures, with even small, highly-efficient cars beating brochure figures by wide margins, shows engine technology is moving on rapidly in all its forms, which is great news for consumers. Sponsored by RAC Business, ALD Automotive and Crystal Ball, drivers were charged with working out the most economical route between a number of waypoints in Leicestershire, Lincolnshire, Shropshire, Northants and Warwickshire in a two-day event starting and ending at the prestigious Marriott Forest of Arden Hotel near Coventry. Fans of the event – which took place on 3-4 October – were able to track the vehicles’ progress live using telematics data supplied by sponsor Crystal Ball, which broadcast where each car or van was at any given time via the event website, while each vehicle’s fuel use and adherence to the rules that they should be standard road cars available to consumers was monitored by the RAC. To view the breakdown of all the winners and find out more about the event, go to www.thempgmarathon.co.ukFor more of the latest industry news, click here.